| New York, NY – April 27, 2017 | A shared respect for the environment and passion for design brought Fil Doux Textiles and designer Clodagh together to create the Nomad Collection of upholstery textiles and bed throws for hospitality spaces. The Nomad Collection provides a glimpse into the eco-philanthropic designer's journeys across the world. “Experiences create no excess baggage,” says Clodagh, who, having travelled to over 100 countries, employs the cavalcade of memories and nostalgia of the sounds, tastes, colors, shapes, light, touch and fragrances to provide her with the greatest design inspiration. 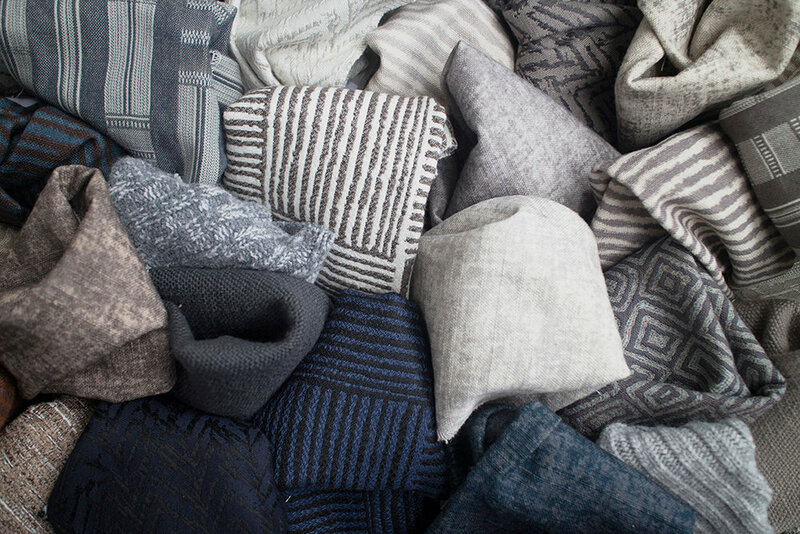 The collection includes woven and printed cotton-blend fabrics in 15 earth-inspired colorways and a coordinating series of throw blankets. Fil Doux Textiles’ eco upholstery and multi-purpose fabrics are woven from the company's proprietary FabuTouch yarn that mixes the fibers within the yarn to create superior durability while maintaining a soft hand, reminiscent of residential products. The tactile throw blankets are pre-shrunk and machine washable, making them a perfect selection for hospitality and residential environments alike. Bayon. Creating order among disorder, this graphic pattern is inspired by the lyrical geometry of Cambodian temples. Douro. Winemakers in this Portuguese valley adapt to steep slopes by placing rows of grapes on alternating terraces. Douro’s shifting lines resemble the region’s geometric landscape. Lamu. Named after a small island off the coast of Kenya, Lamu was inspired by the “kuba” - or grass - cloths sold outside local stores. Lhasa. This pattern was inspired by the wabi-sabi, or imperfect beauty, of plaster on ancient Tibetan temples. Mali. In the namesake African country, designs decorating the outside of huts are achieved by pressing textural objects, such as corn cobs, into their malleable walls. Clodagh reflects this practice in the graphic repeat of Mali, a double-sided and multi-functional fabric. Nara. Referencing the elegant restraint and silence of Japanese fabrics, Nara’s irregular stripes are reminiscent of the country’s shibori dying technique. Sevan. Named after the Armenian lake, Sevan features multiple thread colors and heights to achieve a complex plane of texture that is reflective of the region’s own rocky landscape. Sadhu. A religious traveler who owns nothing and lives in a zen-like state, Sadhu’s texture asks for little and functions as the collection’s support system. Kerry. This large scale knit reflects Clodagh’s Irish heritage, and the traditional cable knit sweaters worn by Aran Island’s fisherman. Corrib. The perfect complement to a larger scale cable motif, this textural, striped knit blanket belongs anywhere and everywhere. For more information on The Nomad Collection, visit fildoux.com. Internationally acclaimed designer and philanthropist Clodagh passionately believes that good design supports well-being and that it can transform people’s lives. She feels that clutter can undermine serenity, but minimalism should not be self-denying. A believer in the tenets of integrative medicine that address the entire body and psyche as a whole, Clodagh embraces both ancient and cutting-edge methods in an effort to comfort not only the body, but also the mind. Among the earliest adopters of Feng Shui in her design practice, Clodagh is always ahead of the curve by incorporating such cutting edge modalities as chromatherapy and biophilia, while including comfort, into all of her projects and products. One of the world’s leading innovative multi-discipline design practices, Clodagh Design’s award-winning portfolio spans over 30 countries and a wide range of eco-conscious projects and products that include million-square- foot hotels, residential buildings, international spas, private residences, restaurants, retail stores and showrooms, offices, women’s apparel, cosmetic packaging, branding, furniture, home furnishings, healthcare and even private jets and luxury yachts.